It is important to consider crypto trading regulations, no matter where you live. Thus, this article concentrates on crypto regulations for investors that wish to get into crypto and Bitcoin trading. We first go over how regulative bodies take a different approach around the world. Then, we provide information regarding crypto trading platforms that operate and those that do not under legislative policies. Finally, we provide issues of unregulated markets. Related articles are pay tax on crypto trading and crypto trading platforms. We do need to stress the fact that regulations are not the same around the world. Some governments took the more active role and proposed entire policies solely for cryptos. Others took more passive approach due to how small their markets are. Thus, we separated three different regulation types that you should be aware of, depending on where you live. These are Active, Semi-Active, and Passive regulations. Active legislative systems are those found in USA, EU, and Canada. In these systems, cryptocurrencies, regulated as online assets and not as legal tenders. Thus, income taxes apply once you made a profit if you use fiat currencies. In this sphere, trading using different strategies is possible only through licensed brokers, like Bitfinex, Coinbase, and Robinhood. Semi-active legislative systems can be considered to exist in Costa Rica, Switzerland, and India. These systems might recognize cryptocurrencies as payment methods but do not hold any specific policy of them. Also, they also might allow exchanges to work with cryptos but ban its banks from dealing with it (India). Passive stance can be seen in countries like Iran, Turkey, and Cyprus. Government bodies do not recognize cryptos as either asset or currency. They also do not provide any sort of legal framework, leaving the market to regulate itself. In this section, we provide a list of crypto trading platforms that offer crypto trading instruments and are regulated. These are AvaTrade, GDAX, Crypto Facilities, and Robinhood. AvaTrade – Founded in 2006, the platform offers a variety of commodities and currencies for trade. Cryptos are included as well, if only recently. The trading platform operates through license by several countries, including Australia, Japan, and EU. It also has 11 offices in different countries, meaning that it is completely a regulated business. To know more about its features regarding cryptos, read our review by following this Avatrade review. Crypto Facilities – The trading platform known as Crypto Facilities is a UK-based company, licensed and regulated by the Financial Conduct Authority (FCA). The company provides margin trading tools for cryptocurrencies. Since 2016, due to the licensing issues, the platform withdrew its support from the US soil. It shows that regulated businesses can operate around the world so long as they acquire licenses and trading rights. Robinhood – The platform is a mobile application that offers trading services for its clients. The company is registered under SEC, USA and performs its services only for US customers. Cryptocurrency trade locates itself in Robinhood Crypto, offering trading tools and services. The issue with the platform is that it has very limited regional coverage, with plans on adding Australia in 2018. You can check out more details about the trading center through this Robinhood review. GDAX/Coinbase – GDAX is a subsidiary of Coinbase, an American platform, which offers trading services for its clients. The trading platform is available in 32 countries, USA included. GDAX, through Coinbase, got its licenses from many US states but not for other countries it supports, as seen below. Nevertheless, it does legally offer its products as well throughout different regions. Apart from those trading platforms that follow legal jurisdictions, there also those that do not. The reason for this is to avoid tax implications by remaining in the grey area. In this article, we go briefly over them, with chosen platforms being Binance, KuCoin, Bitfinex, and Kraken. Binance – This crypto-to-crypto exchange has a basis in Malta, due to more aggressive approach form government in China and Japan. Initially Chinese, due to ICO ban, the company moved its operations towards a country that had light policies concerning cryptos. In order to avoid tax implications, it does not offer fiat trade or deposits as well. To know more about the trading site, head over to our Binance review. KuCoin – KuCoin is very similar to Binance in many aspects. It is a trading platform that offers crypto-to-crypto trade services only, disregarding fiats altogether. The reason is very similar to what Binance thought, as, in this way, it bypasses the tax implications. Its headquarters lay in Hong Kong, though it is only a matter of time when its office might switch elsewhere due to China’s attitude towards cryptocurrencies. Bitfinex – Bitfinex is the largest trade center in the world when USD to BTC pairing is concerned. The platform offers complex trading functions and yet is not a regulated business in most states in the US. 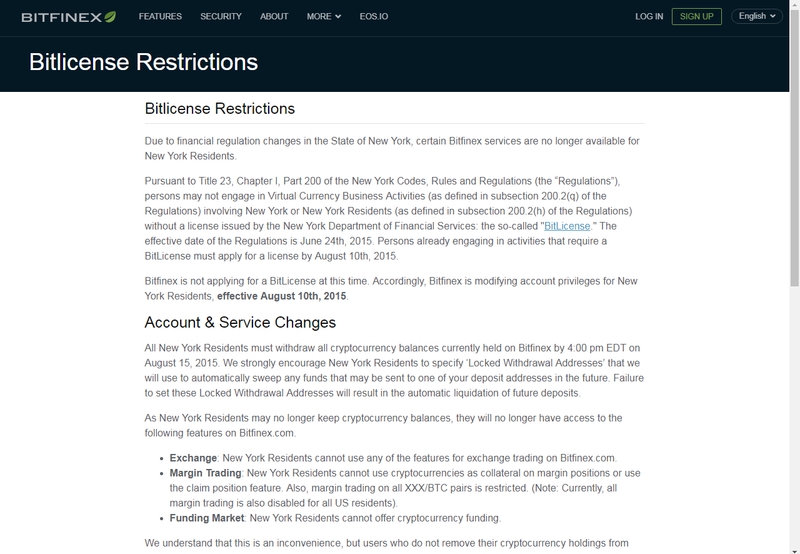 The reason for this is its refusal of the New York’s BitLicense and other licenses necessary for operations. It even posted an official response regarding the license, as seen in the picture below. You should definitely check out our guide about the platform, available through Bitfinex review. Kraken – Surprisingly enough, Kraken decided against the New York’s Bit License due to large costs associated with the legislative document. Furthermore, Kraken has also withdrawn its operations from Japan, due to changes in the regulatory policies for crypto businesses. Still, the company offers steady services with very few issues. Thus, we would recommend you to read our review about the company, by clicking this [link]. Although you as a trader would not need to pay any taxes if you operate through unregulated marketplaces, you should be aware of its downsides. Without clear legal policy behind the firm’s operations, you are not protected from company’s theft of coins or its business default. This means that you are at risk of losing your investments as long as you put your trust in them. Furthermore, in some countries, these platforms have been banned (China for example). Thus, you might even face legal penalties should you support the platform with your assets. In this crypto trading regulations review, we identified types of policies and platforms that operate underneath them. Suffice to say, many platforms have not yet come under the legislative system due to tax implications. Thus, it is risky to work with them as no legal protection really exists for traders involved in these marketplaces. We do suggest to at least check out regulated companies, as these provide many trading options, leveraging and margin trading as well.